From Hughes: Stanislaus Joseph Sowinski was born in Milwaukee, Wisconson on May 7, 1927 into a large Polish family. Sowinski was in San Diego in 1946 while in the Navy. While there, he began night classes with Alfred Mitchell. Upon discharge, he entered San Diego School of Art and earned his B.A. degree at San Diego University. He was recalled by the Navy during the Korean War and then traveled extensively for the next 22 years. As commander of the ship, Abnaki, he spent long periods in Honolulu and Japan. Returning to southern California, he soon was soon active in the art shows while giving workshops, teaching privately and at the San Diego Art Institute. He created many Byzantine icons for churches in the San Diego area before his death in San Diego on January 8, 2010. Exh: So. 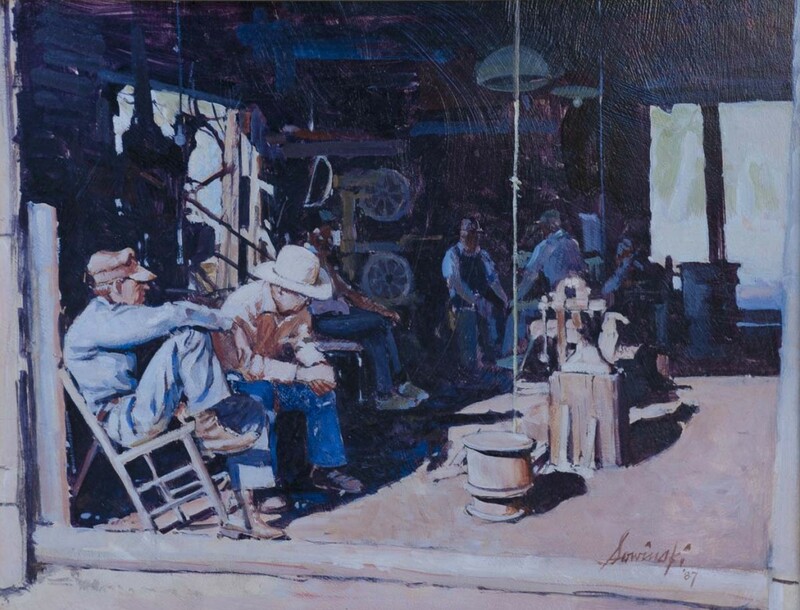 Calif. Expo, 1953 (award); Carlsbad-Oceanside Art League, 1954; Calif. Fiesta, 1955, 1956, 1959; Calif. State Fair, 1956; Laguna Beach AA, 1958; La Mesa AA, 1959 (solo); Laguna Art Festival, 1960; Artists of Hawaii, 1960, 1961. Works Held: U.S. Navy Dept (Washington, DC); University of San Diego (large dyptich); St Mary’s Church, Escondido (altar and 5 large paintings).